Custom Website Design for GSA consultants | Another great custom web development by VISIONEFX. This new custom website development features custom flip focus box navigation boxes to display multiple interior page links. The website also features call-to-action information areas and image display. The web development framework is an original custom Word Press website hosted on Linux hosting at Go Daddy web hosting. 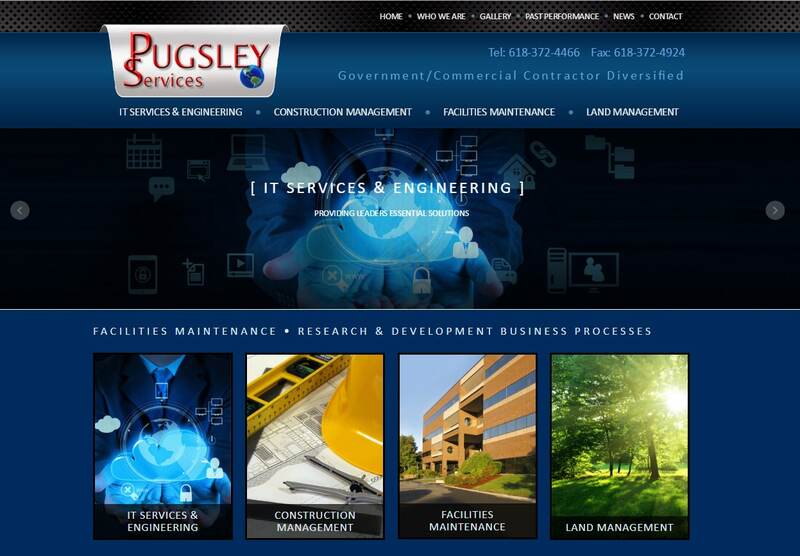 Pugsley Services provides services to the U.S. Army Corps of Engineers, Defense Information Systems Agency, Federal Aviation Administration, U.S. Department of Veterans Affairs and the U.S. Department of Defense. Pugsley Services has offices in Brighton IL. When searching custom Web site design, development Virginia Beach look no further than the VISIONEFX web design, development professionals. VISIONEFX, a Web design company based in Virginia provides custom website design services to national companies and small to medium businesses throughout the United States to include; advanced custom Word Press web design, HTML 5 development, E-commerce web sites and product database programming, Word Press Plugin customization, Joomla web development, Search engine optimization and web maintenance services. For more information about Custom website development Virginia Beach call VISONEFX at (757) 619-6456 or email direct to info@visionefx.net.